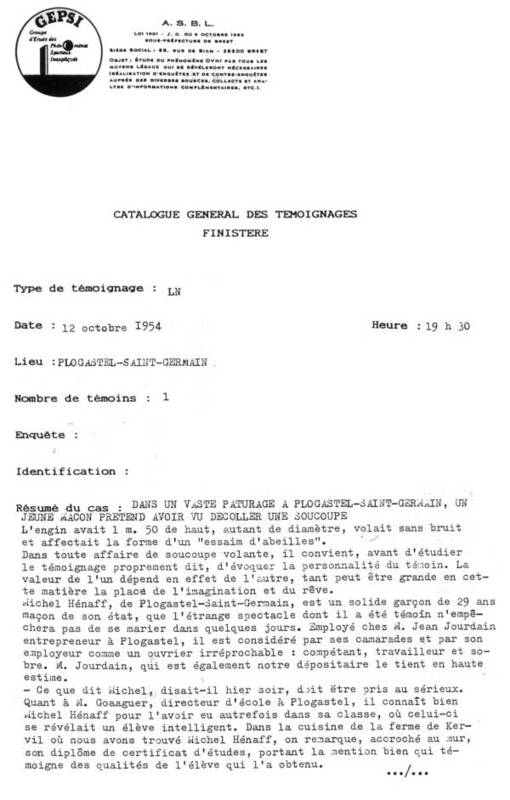 Reference number for this case: 12-oct-54-Plogastel-Saint-Germain. Thank you for including this reference number in any correspondence with me regarding this case. The machine had 1 m. 50 of height, and the same diameter, flew without noise and has the shape of a "swarm of bees." In any flying saucer case, it is appropriate, before studying the testimony itself, to mention the personality of the witness. The value of the one depends indeed on the other, so much can be the imagination and dream in this matter. Michel Hénaff, of Plogastel-Saint-Germain, is a solid boy of 29 year old, mason of profession, that the strange spectacle of which he was the witness will not prevent from getting married in a few days. Employee by Mr. Jean Jordan, contractor in Plogastel, he is considered by his comrades and his employer an irreproachable workman: competent, hard-working and sober. Mr. Jordan, who is also our agent holds him in high esteem. "What Michel says," he said yesterday evening, "must be taken seriously. As for Mr. Goaaguer, principal in Plogastel, he knows to Michel Hénaff well because he had him formerly in his class, where this one revealed as an intelligent pupil. In the kitchen of the farm of Kervil where we found Michel Hénaff, we noticed, hung on the wall, his diploma of certificate of studies, being marked with the "bien" mention which testifies to the qualities of the pupil who obtained it. Michel Hénaff did not refuse to describe for us what he saw. "I had not spoken about it around me except for my parents and to some comrades, but since you me ask, well, I will do it." "On Tuesday October 12, at about 07:30 P.M, Michel Hénaff went to his parents who live in a farm next to his. The weather was bad. A drizzle fell which rusjed the fall of the night. To cross short, he had left the main road and went through the fields. Skirting a slope, he saw suddenly at his height, in the nearby field on the other side of the slope, the most distant from him (within 60 meters approximately), a reddish gleam, partly by masked by the moor. - I thought, he said, of a person who was in the field with a flashlight. This astonished me, but not that much. I merely thought that if he had a lamp, this lit quite brightly, and I continued my walk. It is while arriving at the top of the field that Michel Hénaff, intrigued all the same by this gleam, turned to look back. He was totally amazed: within 300 meters of him and at 40 meters approximately above ground-level, he saw a luminous reddish machine move away while taking height, of which he can give a precise description. - this machine had quite the shape of a swarm of bees with somehow vague contours. "it was luminous and flew very quickly. In its median part, I distinguished some sort of wings which seemed to move. The shape of this machine was that which the young schoolgirl of Gouesnach drew. Annick Le Bris, of which I saw the photograph in "Le Télégramme." - According to you, this saucer had just left the field? - For me, there is no doubt abut that. The gleam was exactly that which I saw in the field, hardly a little stronger perhaps. The saucer then took height and, in 5 or 10 seconds, disappeared from the sight of Mr. Hénaff while flying towards the east, i.e. to the direction of Quimper. We asked Mr. Hénaff which dimensions he roghly allotted to this machine. - 1 m 50 of height approximately, he answered, and as much in diameter. As for noise, I did not hear anything. The witness felt a strange feeling at the sight of this spectacle. - On the blow, I was only amazed, but after I was a little afraid. If I had known, he says, I would have crossed the field and I would have approached a little, without going too near all the same. The fields in which Mr. Hénaff and the flying saucer were are vast pastures, very flat, located in a countryside which is far from being deserted. This is why one can be astonished that other people did not see the saucer, for the hour was not very advanced: our question on this subject does not astonish Michel Hénaff. - I wondered myself about that when I sometimes read the accounts of appearance of these mysterious machines in the newspapers. But, now, I do not do it any more. If I had not turned back myself at the end of the field, quite by chance, a little because the seen gleam intrigued me, I would not have seen anything, and would never had suspected that I had just passed close to a saucer, of which the appearance in the sky lasted only a few seconds. Nothing else could have drawn my attention. Michel Hénaff hardly speaks about what he saw and does not seek to convince anybody. I understand the attitude of the others, he says; one believes only what one sees, and myself, previously, I reasoned like this also. But, now, I am all the same obliged to recognize that there is something. This boy full with common sense and wisdom dos not overworry, thinking that we will have the explanation of all these phenomena some day. For the moment, he has other concerns, and since he will wedd soon, we will take the opportunity to present our compliments and our best wishes to him. 46 - October 12, 07:30 P.M., Plogastel-Saint-Germain, Finistère. Mr. Michel Hénaff, mason, aged 29, while passing along a field, suddenly saw a spherical object of about 1 m 50 of diameter, raising in the sky as if it had taken off. Source: Le Télégramme, Brest, October 23, 1954, p.3. Ufology group G.A.B.R.I.E.L. wrote that on October 12, 1954, in Plougastel, in Finistère, when the evening came, a young mason observed a kind of luminous swarm of 1.50 meters of diameter, "animated in its central part by many ailerons." The object rose from a field at a distance of 60 meters of the witness. The group notes that the observation was completely unknown to ufologist Aimé Michel and that it is perhaps still unknown. They announce that this observation place is aligned with other observations places which are aligned according to Aimé Michel, including that of La Rochelle and that of Vielmur-sur-Agout. The group cites as source an article by J. Giraud in the newspaper "Centre Matin" in 1954. The magazine lists the case at October 12, 1954, 19:30, in Plogastel-Saint-Germain in Finistère, indicating that Michel Hénaff, mason, 29 year old who passed along a field suddenly saw rising in the sky as if it had just taken off, an spheric object of 1 m 50 of diameter approximately. The magazine indicate that its source is the newspaper "Le Télégramme de Brest" for 25.10.54 in page 3. A spherical object rises above a field as if it had just taken off. 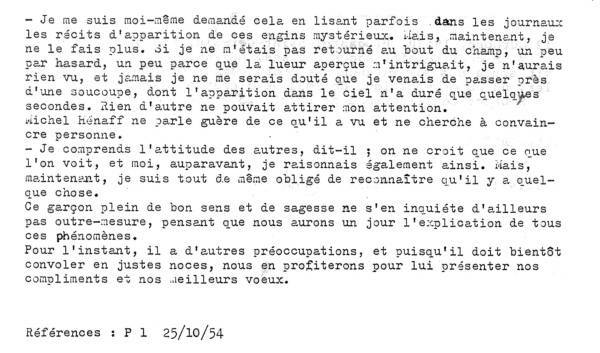 French ufologist and author Jean Sider learned in an article from the newspaper Le Telégramme, of Brest, published on October 23, 1954 on page 3, that on October 12, 1954, at 07:30 p.m., in Plogastel-Saint-Germain, in the department of Finistère, Michel Hénaff, a mason of 29 years old who passed along a field, suddenly saw rising in the sky, as if it had just taken off, a spherical object of approximately 1m50 of diameter. Luc Chastan indicates that in the Finistère in Plogastel St Germain on October 12, 1954 at 19:30 hours, "the witness went to his parents living in a farm neighbor of his. Weather was bad. It fell a drizzle which fell the night. To cross short, he had left the main road and went through fields. Skirting a slope, he suddenly saw at his height, in the close field and the other side of the slope, most distant from him, (within 60 meters approximately), a reddish gleam, masked partly by the moor." " - i thought, he said, of someone who was in the field with a flashlight. That astonished me, but not much. I noticed only that if he had a lamp, it lit quite well, and I continued my way." "It is when arrived at the top of the field that the witness, intrigued all the same by this gleam, looked back. He was literally amazed: within 300 meters of him and 40 meters approximately above ground-level, he saw to move away while taking height a luminous and reddish craft, of which he can give a precise description." " - this craft had approximately the shape of a swarm of bees with fuzzy contours. It was luminous and flew very quickly. In the middle part, I distinguished kinds of wings which seemed to move. To me, there is no doubt. The gleam was exactly the one I had seen in the field, hardly a little stronger perhaps." "The object then took height and, in 5 or 10 seconds, disappeared from the sight of the witness while flying towards the east, i.e. in direction of Quimper.According to the latter the object was 1 m 50 approximately in height and as much in diameter, moving without noise. The fields in which the witness and the object were are large rather flat pastures located in a country which is far from being deserted. " The website indicates that on 12 October 1954 at 19:30 in Plogastel-St Germaine, France, "1.5m diameter sphere rises from field." And: "An object was sighted that had an appearance and performance beyond the capability of known earthly aircraft. One sphere, about 5 feet across, was observed by one witness on a farm for over one minute." 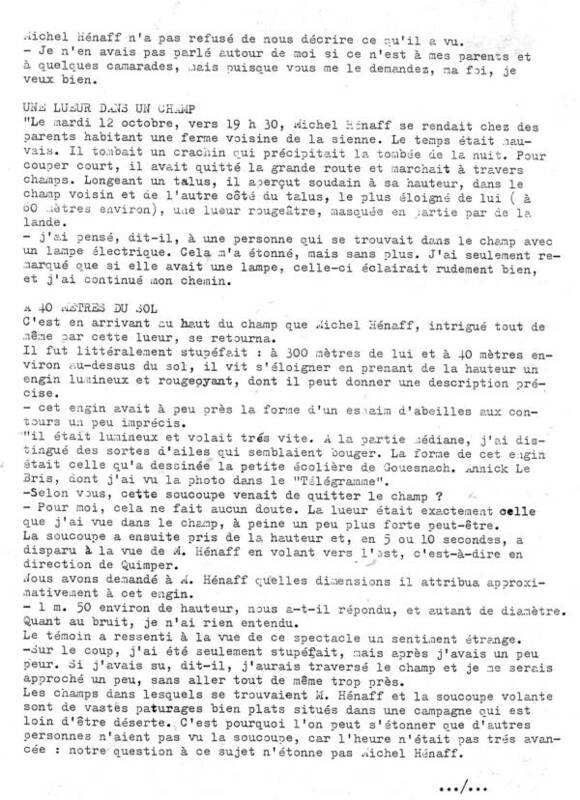 [---] Article in the regional newspaper Le Télégramme de Brest, Brest, France, page 3, 23 octobre 1954. [---] Article in the newspaper Centre Matin, France, 1954. [ge1] File record, GEPSI ufology group. [ga1] "Soucoupes Volantes: Le Grand Refus? ", book by the ufology group G.A.B.R.I.E.L., Michel Moutet publisher, page 123, 1978. [ld1] Ufology magazine "Lumières dans la Nuit", #319, pp 17-18. [ld2] DOCUFO, by the ufology magazine "Lumières dans la Nuit".